In the decades of literature about the history of Superman, I've noticed an odd omission. The house in which Jerry Siegel lived when he envisioned Superman is still standing. Cleveland protects it as a designated landmark. An illustration of its interior is in Boys of Steel. But Superman was not fully created in Jerry's house. He was not fully created until Joe Shuster drew him. 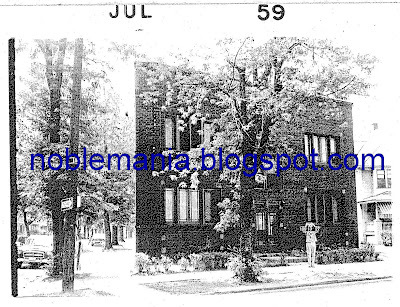 Why hasn't anyone published a picture of where Joe lived in 1934? For starters, it's no longer there. And since apparently no one knew its significance when it was torn down, it was just another derelict building, requiring no special archiving. Which meant it could take a lot of looking now to find a picture of it. After my research trip to Cleveland in January 2007, I can confirm that it took a heckuva lot of looking. Armed with the address of Joe's former apartment building on Amor Avenue, I was pumped. First stop: Western Reserve Historical Society. For more than six hours, I rifled through archival photos. They were not digitized. The staff brought containers out to me—big, often dusty boxes. It wasn't that long ago but I already forgot how they were organized. No matter—I searched every possible container and did not find the Amor address. Third and final stop: Cleveland Public Library. I was the least optimistic about this. It just seemed that something so unlikely to exist could not be found at a place so mainstream. Here the photos were stored in small boxes, organized by street. I hunkered down, the only guy in the room besides the librarian. I went through all the Amor photos. Nothing. Then a new thought brushed up against me. Joe's building had an Amor address but was on the corner of another street, Parkwood. I asked for the Parkwood box. On the back of one photo someone had scribbled a Parkwood address—and then an "AKA xxxxx Amor" address. Joe's Amor address. This photo of what was once called the Maple Apartments is from November, 1974. The building was demolished the next year. I had to tell someone. Couldn't use my cell phone in the library. So I went up the guy behind the desk and said, "I know you probably won't care, but this is the building in which Superman was finalized." He tried to care but I think he was mostly glad I was done asking for boxes. In that unassuming building, Superman first put on a cape and an S-emblem. In fact, he was almost certainly named in there, too (though Jerry and Joe had already used "Superman" for two earlier unrelated characters). 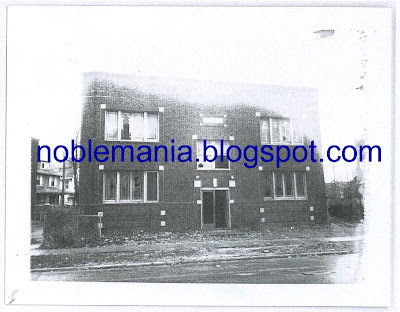 My Planning Commission man also confirmed that the building was indeed the same that would've been there in 1934. He could even tell me it was built in 1916 (though at first I thought it looked more modern than that). You have to think that if the city had kept track of its history, the building would still be there today. You have to wonder how no fans came forward to tell the city. It's not likely because fans didn't care. Hard as it is to process in the Internet age of quick-grab info, it's most likely because fans didn't know. Now I am in touch with people who are in touch with the Shuster family and I could just ask them if the Shusters have a photo of the building, maybe even one circa 1934. But at that time, people had little to be sentimental about, so perhaps not. More news to come about these photos as we sweat closer to August. This is awesome!!! Nice job researching! I wonder if there's vintage aerial photography? I've seen one of my neighborhood from the 30's. Great job, Mark! Good luck tracking down more shots, too. Next time I'm in Cleveland I'll be able to gaze at the spot and actually have a building to visualize. Outstanding research! This is the kind of thing I can really get into (as wife rolls her eyes). Can you please, please post these with a smaller watermark? Thanks for sending the update info, Mark. My own researching has fallen down last couple years as i cannot walk very well or lift comic book boxes easily, needing hip replacement operations, long story. I had a lot of fun tracking down Superman's creation with Jerry, Joe, Julie and Mort as teen age fan boys circa 1929-1934 thru their fan letters in Amazing, Weird Tales, etc - plus getting Jack WIlliamson, Julie Schwartz and other's input of those left alive. This culminated in an 8000 word piece cut from 12,000 words in Gemstone's Comic Book Marketplace #50 in 1997 as the San Diego Comicon special overprint issue. Glad to see more of us taking the ball and running with it, nice sleuthing, kudos and keep up the great work. Fantastic to see where the house Joe grew up in was located and what it looked like. There was a guy on the GCD who died some years back who lived in Cleveland, his name eludes me, initials RL stand in my brain, but most likely might be wrong, who had located the original studio to being under-neath a billboard back in the mid 1990s. This site is great. Keep up the work. Great sleuthing, Mark! All that digging paid off nicely! The most exciting part about this is seeing how excited you are tracking down these details. Great work Marc!